Angioimmunoblastic T-cell lymphoma (AITL) is a common subtype of peripheral T-cell lymphoma with an aggressive clinical course and poor prognosis after conventional chemotherapy, for which there is no current standard of care. We describe here an 87-year-old woman with AITL, whose clinical diagnosis was complicated by the presence of B immunoblasts positive for Epstein–Barr virus in the lymph nodes and monoclonal plasma cells in the bone marrow at initial presentation. Rebiopsy of the lymph node led to the correct diagnosis of AITL with concurrent smoldering plasma cell myeloma. She was treated with several courses of conventional chemotherapy, resulting in progressive disease, and then switched to the immunomodulatory drug lenalidomide, which used in Japan for the treatment of multiple myeloma. 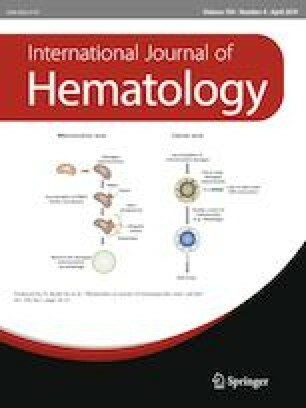 Lenalidomide was effective in controlling both AITL and plasma cell myeloma. The online version of this article ( https://doi.org/10.1007/s12185-018-02587-6) contains supplementary material, which is available to authorized users. We thank Mr. Masahiro Hirata and Mr. Hiroyuki Shirahase, Department of Diagnostic Pathology, Kyoto University Hospital, for their technical assistance.